Well this is exciting. My online sewing friend Savage Coco (yes, the designer of the Presto Popover top that took the sewing world by storm last year) has completely rebranded and revamped her website and shop. Coco and I have never met, but have exchanged many emails. She is hilarious and very talented. To celebrate the website launch, Coco has released a pattern combo for this brilliant little Summer Solstice Set, consisting of a skirt, top and bonus cap. Take note Aussie and NZ friends - we don't often get new pattern releases that suit our seasons. We can wear it first for a change! The new company name is Naughty Bobbin Patterns (formerly Savage Coco Patterns) and you have to visit the website just to see the cool sewing cartoons on the homepage! Anyway, this set. The skirt is a simple straight design with a smooth elastic waistband and the top is a tank style with a flattering, square neckline that dips lower at the back. The top has a built-in shelf bra and is sewn together in a clever way that creates a completely clean finish inside. Both items are made from knit fabrics. I used ponte for the skirt and cotton jersey for the top. I made a size M with no changes. The fit is spot on and I love that the top completely covers my bra straps from all angles. But wait, there's more! This is the Coco Cap, which also forms part of the Summer Solstice Set. I am thrilled with this as it gives lovely shade and looks so much better than a normal cap. 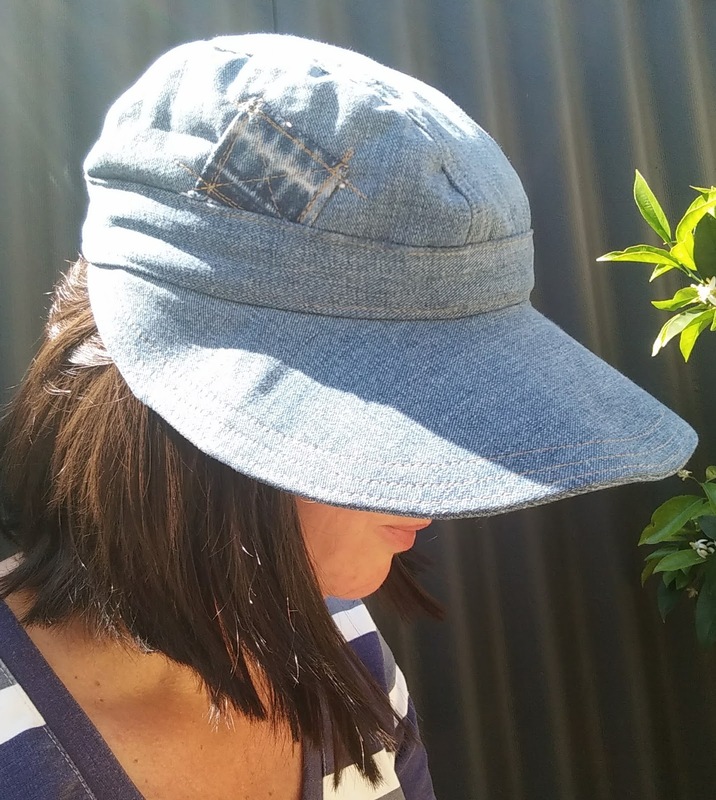 I made mine from denim scraps left over from the Refashioners 2016 Jeans challenge. I forgot to wear it in the other photos so I tried to take some selfies - not easy when you are trying to show off a hat, I kept trying to look at the camera. 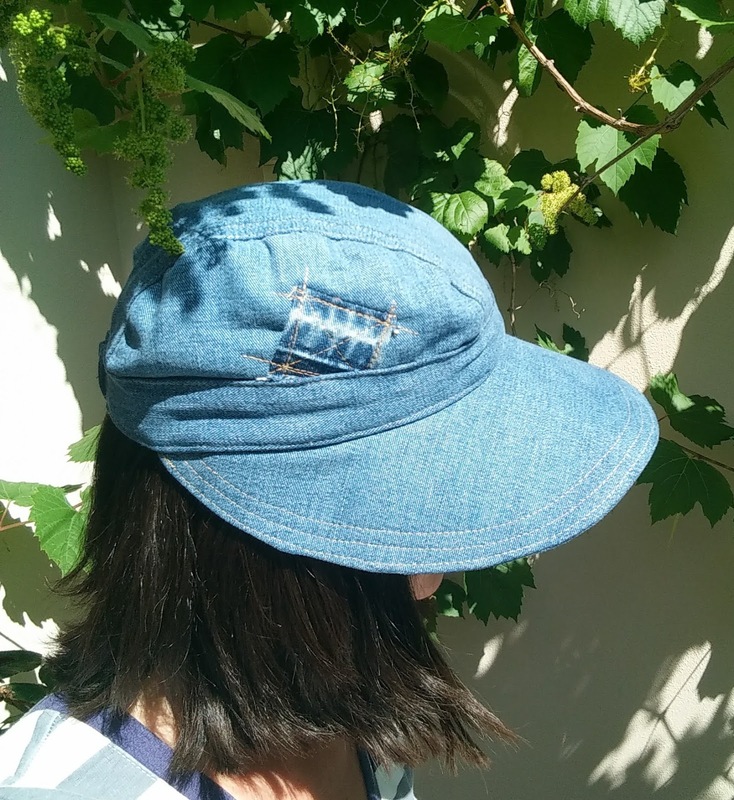 The hat is a great fit and has a back elasticated section that can be adjusted to fit during construction. I have a large head, so I was happy to find that this was big enough. It is lined, but not difficult to make. The brim is stiffened with pellon interfacing. This is not easy to get in Australia. An alternative would be two or three layers of your stiffest interfacing or steal the plastic cover from your child's school exercise book. I am over the moon with this set and highly recommend it. Everything is well thought out, well fitting, stylish and with clear instructions. The skirt is so comfy and quick to make, I'm going to have one for every day of the week. 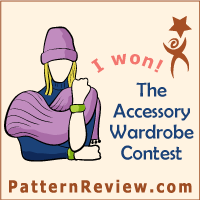 Congratulations to Naughty Bobbin Patterns! Naughty Bobbins! I love the name. The neckline on the tank top is very stylish. Great job on the cap. Thank you. I'll be wearing this a lot! Very nice. Looking forward to seeing in in person. Is one of the straps a bit gathered or twisted, as part of the design? Thank you Bronwyn. No, the straps are flat so it's either my dodgy sewing or dodgy posing! Well this is exciting. I discovered you via the PR Sewing Bee and immediately followed you everywhere and now this is a great discovery from you. I've never heard of Savage Coco or her patterns before now, but just a quick look over there and I can already tell I love everything, I've already got 3 things in my cart to buy! Thanks so much, and this outfit looks amazing on you, I really love your work. What a wonderful comment. You have made my day - thank you! Hey Meg! Thank you for this post! I've been looking for this type of top for ages! Your top came out so great that I rushed over and grabbed the pattern for myself along with that fabulous Amare dress! Her new site is just darling so thanks for the heads up. Our cooler weather may have arrived here in the States but I live in the desert south west where these pieces will be just perfect for our weather in my area. Keep up the great posts, I love the inspiration and I am always learning something new on your site! Thanks so much! Hi Deborah, that is great news. I love the Amare dress, it's a gorgeous pattern. I am sure you will enjoy wearing these pieces in your lovely warm climate! I love a summer top that you can wear a bra with! Strapless bras are so annoying to wear. I like the black and white combination you have chosen. This is a lovely ensemble and you look fabulous in it. I have just downloaded this pattern after seeing yours and Sue's (Fadista's). It will be a perfect outfit for a Qld summer. That's great news. This will look fab on you! Oh I love this. The cut of the top is so stylish. Great outfit! Thank you! This would suit you too. Glad I stopped by your blog! Though this set does not fit my current season, I do like it and that top would work well under a jacket during cool months. You look great in this! Thank you so much. Great idea to wear with a jacket!